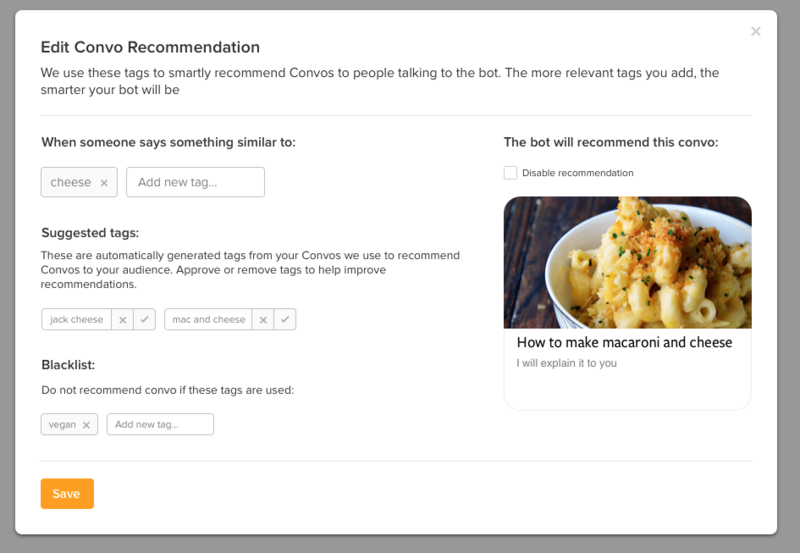 Convo recommendations allow your bot to recommend convos to customers based on the messages they send. For instance, if you have a recipe bot and one of your recipes is about mac and cheese, then if a customer types "How do I make mac and cheese?" you will want the bot to suggest the mac and cheese recipe. How are Convos recommended to customers? We look at what the customers have said and try to match it up against the tags for each Convo. If we find more than one relevant Convo then multiple Convos are sent to the customer in a list so they can choose the best fit. If no relevant Convos are found than the bot will use the normal response for an unrecognized message (by default, it won't reply). Suggested tags are tags that our algorithm found from your Convo. If you think these are relevant tags for your Convo, approve them with the checkmark. If they are not relevant, remove them with the x. Should I add my own tags? If you think there are other relevant tags for your Convo, please add them. This will help your bot better respond to your customers. How does it suggest Convos based on these tags? We use an algorithm to determine which is the right Convo (or Convos) to be suggested by scoring what the customers said against what we know about the Convos from these tags. What does it mean to disable the recommendation? If you check "Disable recommendation" then your bot will never recommend this convo to a customer. Is there a certain word or tag that you want to make sure never leads to this convo even if other key phrases are used? Simply add that word to the blacklist.